Valid Every Home Game the Entire 2019 Season! Take the whole family out to the ballgame! Buy them some peanuts and crackerjacks ... and this great deal on an Aberdeen IronBirds baseball game! The season officially begins on Friday, June 14 at Leidos Field at Ripken Stadium when the IronBirds play host to the Hudson Valley Renegades. Grab your tickets and enjoy a fun day filled with baseball action, good food, and special events. The field seats are perfect for kids because you are close enough to see the players' expressions and can really get involved in the game. When you are waiting in between innings, or before the game, there are plenty of activities to keep the kids entertained. With 38 home games and 7 firework shows, come join the fun and the team mascots Ripcord and Ferrous to cheer the IronBirds to victory! Fireworks after every Friday game, plus July 3rd! Come have a pre-game catch on the field before every Saturday game! All kids are invited to run the bases after every Sunday game! Arrive early for HAPPY HOUR specials at every home game from when gates open until 15 minutes prior to first pitch ($3 select draft beers, $2 hot dogs, $2 fountain drinks, and more)! Don't miss the annual favorites like HARRY POTTER NIGHT (July 26th) and STAR WARS NIGHT (August 9th)! More amazing promos, theme nights, giveaways, and entertainment will be announced shortly, and to see just a sampling of what's on the calendar, take a look HERE! Be sure to click HERE for all the latest information to get you ready for the IronBirds games. The Aberdeen Ironbirds are a Class A short-season affiliate of the Baltimore Orioles. 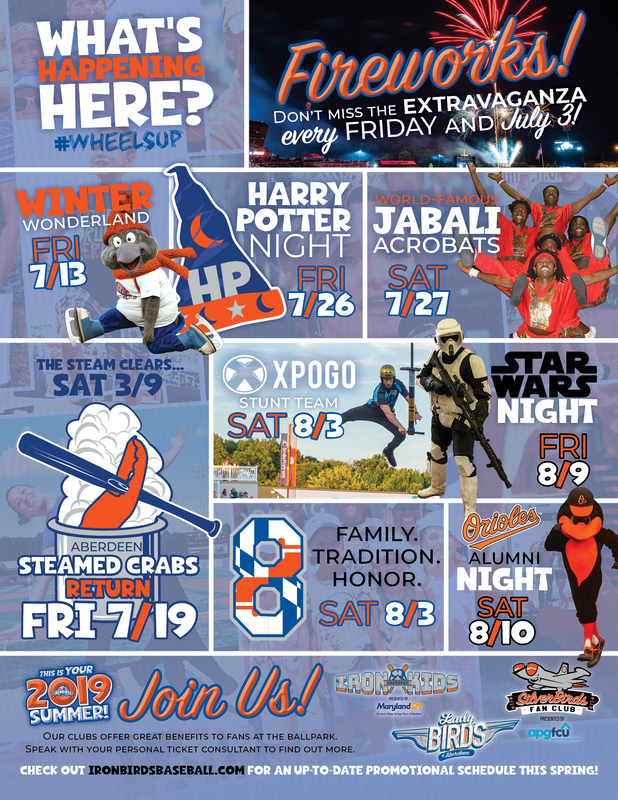 To see the Aberdeen Ironbirds 2019 regular season schedule, click HERE. The Deal: $15 for 2 Field Box Seats to ANY Regular Season 2019 Aberdeen IronBirds Baseball Game @ Leidos Field at Ripken Stadium ($34 Value - Up to 56% Off). Good for ANY regular season home game during the 2019 season - including OPENING NIGHT, all weekend games, and Fireworks games! For groups requesting to sit together, all vouchers must be reserved at the same time over the phone, or redeemed together in person at the box office. Season runs June 14 - August 30, 2019. Fun for ALL ages! Children ages 3 and under will be permitted without a ticket but must sit on parent's lap and not occupy their own seat. Please check the Rain Check Policy HERE. Click HERE for stadium seating chart. Expiration reflects date by which tickets must be redeemed. This deal is redeemable for a weather-dependent outing. Vouchers are not refunded for inclement weather. Please check team website for weather updates and refer to Rain Check Policy linked above. Vouchers may be redeemed (printed or on a smartphone) in-person at the box office on the day of the game, or redeemed in-person at the box office in advance. Advance redemption may be made over the phone by calling the box office during regular hours at 443-327-3302. Please provide 12-Digit CertifiKID Voucher #s for all guests wishing to sit together. Subject to availability. Valid only for Aberdeen Ironbirds Baseball 2019 Regular Season Home games. Limit 8 vouchers may be purchased and redeemed. Offer valid on select seats. Valid only for the dates listed above. Cannot be combined with any other special offers, promotions or discounts. Not valid on prior ticket purchases. Additional service charges may apply. Vendor is responsible for the quality of the products or services provided at redemption. Hours are subject to change; check directly with vendor prior to visit.